Welcome to the website of InText Translation Company, one of the leading translation companies in Ukraine, offering technical translation, DTP, localization and translation of audio and video materials. InText serves more than 300 corporate clients worldwide. Our top priority is the quality of our services. The workflow combines tailored TMS, state-of-the-art technologies and measurable translation quality in proven compliance with ISO 9001 and ISO 17100 standards to ensure that each project is delivered on time and in accordance with the client's expectations. InText is going to T–UPDATE in Tallinn on April 25–26. We will be more than happy to see you there! The Ukrainian Translation Industry Camp is looking for inspiring speakers to share their experience with the vast international translation community! While InText Translation Company is preparing for UTICamp-2019, our CEO Stanislav Kalenyuk and our Deputy Director Stanislav Bogdanov have taken part in the Moscow Translation Club’s 9th meeting to catch up with colleagues and get some ‘conference inspiration’. It has been a wonderful year full of challenging tasks, interesting projects and happy moments. We have done our best to meet and even exceed your expectations. We thank you for being with us and we greatly value our cooperation! May the coming 2019 bring you prosperity, joy, health and harmony, love and all the very best! 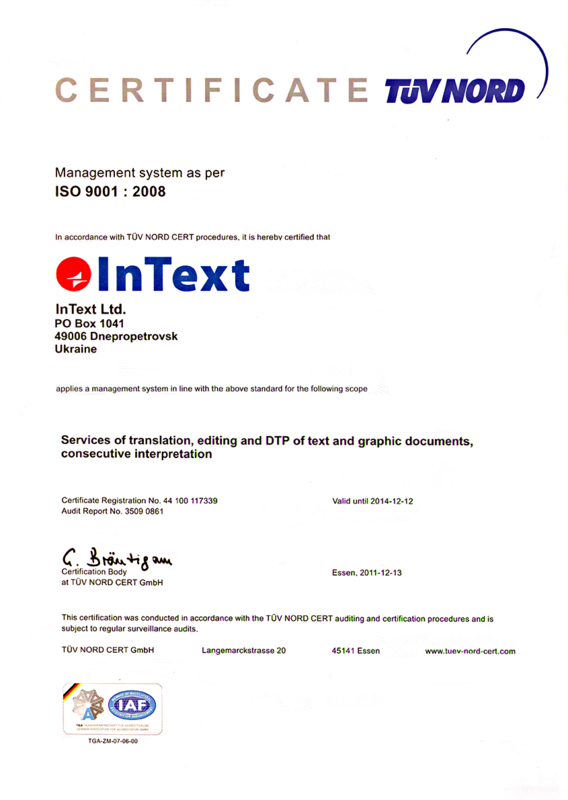 InText Translation Company has held on to its first place among Ukrainian LSPs. Every year, to welcome the new InText employees, we hold an initiation ceremony. Seven new employees have joined InText this year, providing additional resources in the DTP, Automation, and Project Management departments.